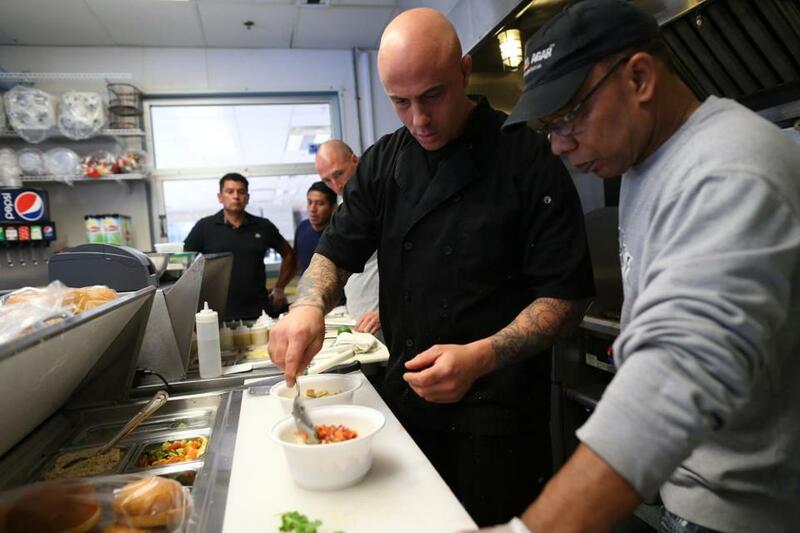 Chef Tony DeRienzo (left) and Nick Levy prepare a SanoVita dish, which can include brown rice, chick-en, and guacamole. Tony DeRienzo of Raynham is good with his hands — in the kitchen and the ring. The 44-year-old head chef at Abby Park in Milton is also a mixed martial arts fighter, training others at Lauzon MMA in Easton. In the latter role, he cooked high-protein, low-calorie meals for fighters to lose weight for bouts, an idea that caught on. He developed a label, SanoVita Meals, and sells precooked meals at Abby Park and the Weymouth Club, which in late May made SanoVita its concession food provider. We talked to DeRienzo for this story. Q. How did this start? A. Fighters needed to cut weight in a short period, so I developed meals that were clean in portion and convenient. My partner at Abby Park started using the plan and lost 10 pounds in a month. We thought we could promote this, and one thing led to another. Q. How much do meals cost, and how do people get them? A. Smaller ones are $10, larger dinners $14. Customers order meals online at www.sanovitameals.com by noon Friday for pickup on Monday at Abby Park or the Weymouth Club. And we also just worked out a partnership with the club to sell an expanded menu there, no preordering required, for people who want to eat on site. Q. What makes SanoVita different than other ready-to-eat meals? A. The type of food — we use a lot of local products, and all natural pork, chicken, and beef. No salt added or sugar, and that’s why people can cut weight quickly and safely. Q. Where did you learn how to cook? A. I went to Johnson & Wales University and cooked in Boston restaurants and was also executive chef at the Stoneforge Restaurant & Publick House in Raynham. But my love of cooking came from my Italian mother. I grew up in Brockton and started cooking with her at 6. Our basement was always loaded with tomatoes; she’d make her own sauce and bottle it for the year. She also made her own prosciutto authentically, in old wine barrels packed with salt and dried for months. My mother is old school. Q. Are you still fighting competitively? A. No, now I just train for Lauzon’s Team Aggression. I’m too busy to fight. Paul E. Kandarian can be reached at pkandarian@ aol.com.